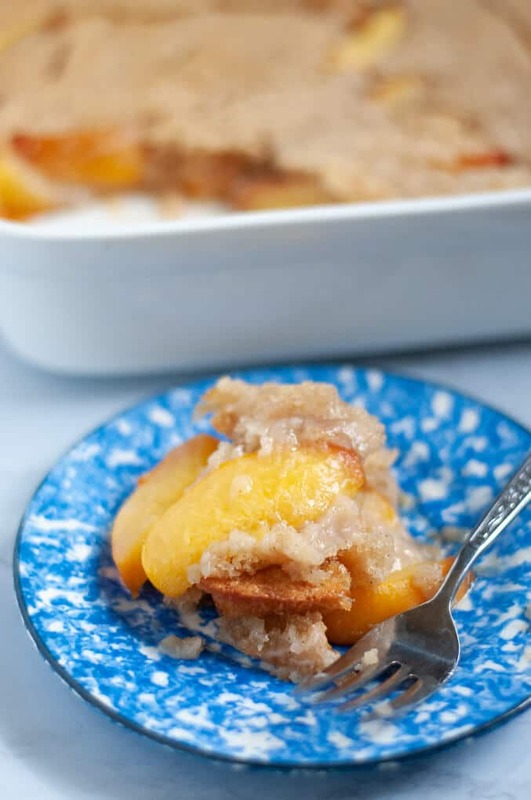 This Cozy Peach Cobbler is an easy classic Southern dessert that’s perfect for every season. Enjoy with juicy fresh picked peaches in the summer or frozen peaches in the winter. Either way you won’t be disappointed in this sweet treat! Well, here it is. The first peach recipe on Cozy Peach Kitchen. 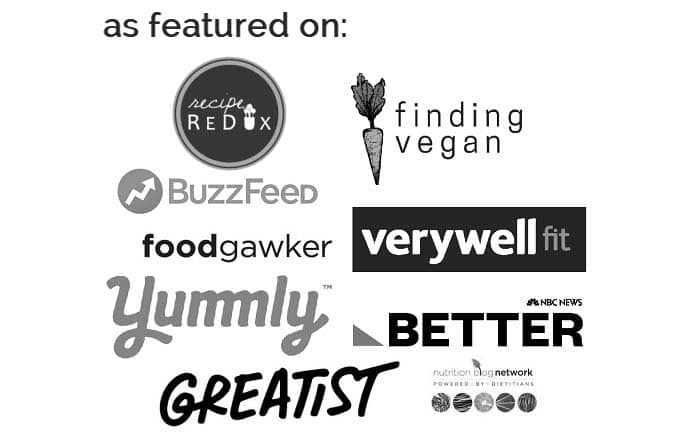 “How did it take you so long to get a peach recipe on your blog? 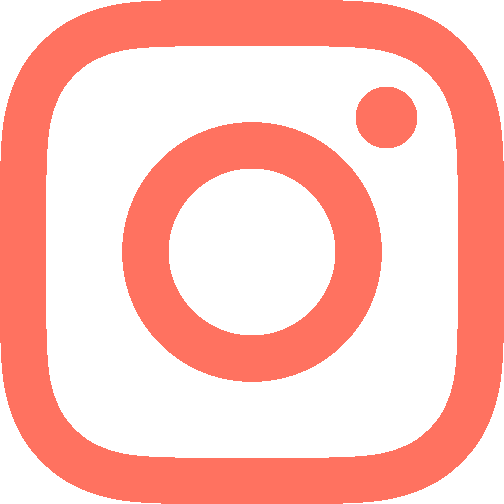 !” you may be asking. Well… I don’t know. I have a bit of a thing against eating peaches while living in Oregon. Sure, they’re good here. But they’re just not the same as Georgia peaches. 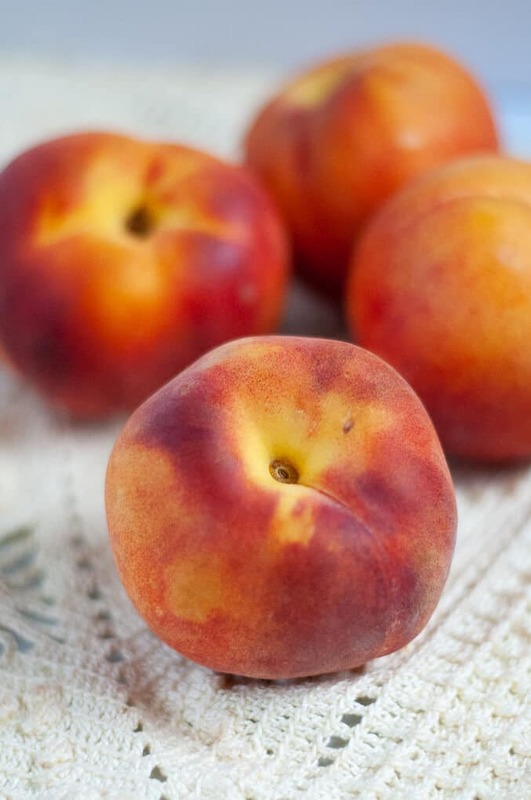 I started this blog back in February, which was certainly not peach season. Frozen peaches are good, but they’re far from the real juicy deal. I get impatient waiting for peaches to ripen in a brown paper bag. I dream about baskets of overflowing, juicy, sweet peaches. The kind that you bite into and juice drips down your chin. I have to leave my Portland peaches in a paper sack for a week to get to them even near that level of deliciousness! Okay. Whine, whine, whine. Here’s the good news for this Georgia peach. I’m moving back to Georgia in just a month! After two years in Portland, it’s time to move back to the place I call home. It’s where my family is, it’s where a lot of my friends are, and it’s where I’ve made many of my best memories. I’ll miss the Pacific Northwest a lot, but I’m so excited to go back home to Georgia. Hence the peach cobbler. 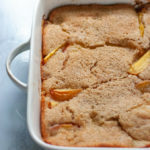 Peach cobbler is a classic Southern dish, and I would argue one of Georgia’s most popular desserts. I mean, hello, Georgia and peaches go hand in hand. My boyfriend is usually my main recipe tester, but this time I really took his opinion to heart. He’s lived his whole life in Georgia (save for these past two years in Portland), so I trust him. I did a fair amount of research when developing this recipe. It’s clear that peach cobbler only requires a few ingredients. 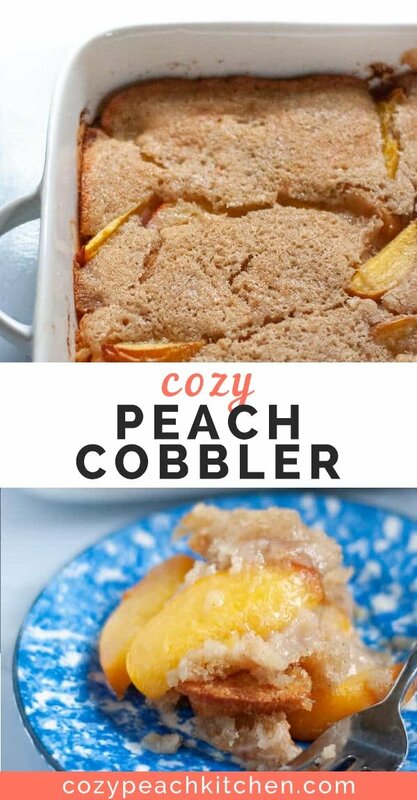 But there’s so many variations of peach cobbler. Recipes differ based on region, family preferences, and the degree to which you’re dedicated to indulging. But let’s be honest: when you’re eating peach cobbler, you’re signing up to indulge. Back to my monologue on the difference between Portland peaches and Georgia peaches. 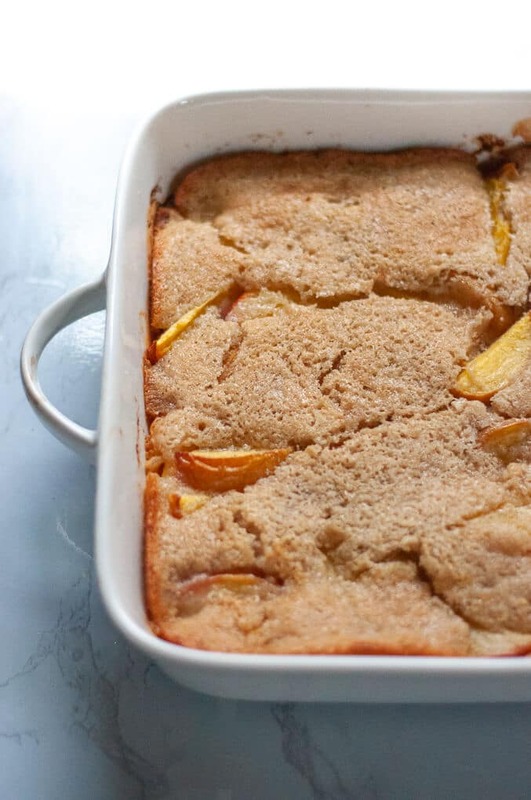 Here’s the saving grace of regional peach differences: peach cobbler knows no difference. After enough time in the oven, the peaches break down and release sweet juices, even if they’re not 100% ripe. Thank goodness! Now, how you like your peach cobbler depends a lot on how you like the crust. I read a lot of comments where people say “It’s not peach cobbler if it’s not a cakey crust” or “it’s not peach cobbler if it’s soft and moist!” I realized I can’t really win here. So I went with my gut, with what I (and my boyfriend) consider classic comfort food: soft, almost bread pudding-like cobbler, with a crisp golden top. None of that pastry stuff here. Just sweet, soft bread and juicy, delicious peaches. As simple as can be. Cinnamon and nutmeg add a wonderful depth to peach flavor. Add a dash of each for extra warmth and richness. You can skin the peaches or leave the skin on. I left the peach skin on, because I’m all about texture. The skin breaks down while baking, but leaves a little bit of crunch that adds some definition to an otherwise soft dessert. That being said, I think the skin vs no skin argument comes down to preference. Frozen peaches work just as well as fresh peaches. If using frozen, make sure they’re thawed prior to baking so that you don’t get a watery cobbler. If using fresh, make sure the peaches are ripe. They don’t need to be 100% ripe and juicy, but if they’re rock hard the final product won’t be as sweet and soft. 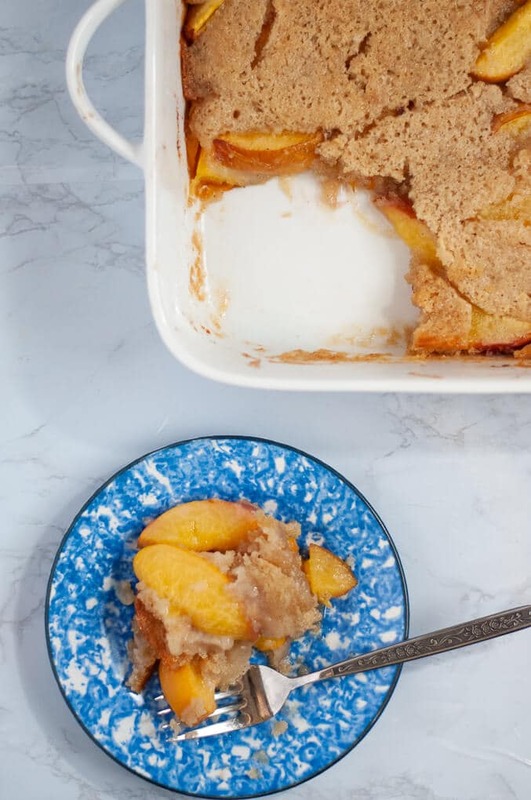 This peach cobbler is easily made vegan. Just switch out the butter for vegan butter and use your favorite non-dairy milk. 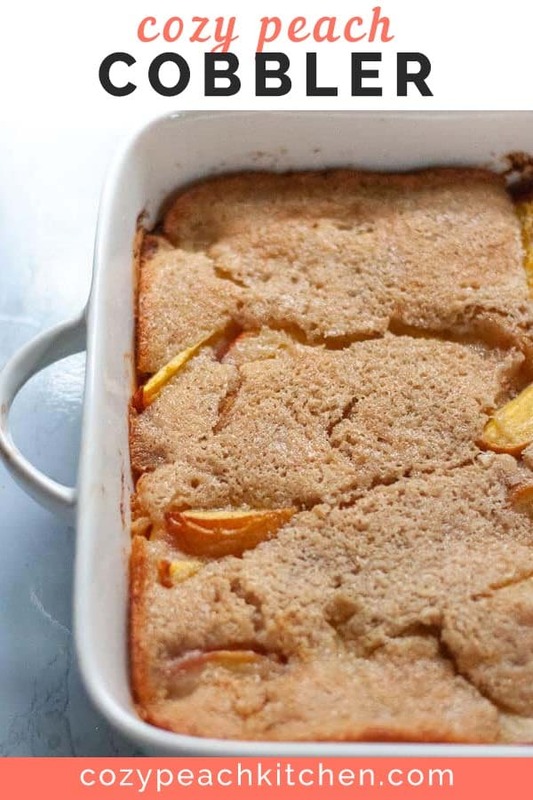 I use soy milk in most of my cooking, this cobbler included. And there you have it folks: my first peach recipe! Stay tuned for many, many more peaches! Easy classic Southern dessert that’s perfect for every season. Enjoy with juicy fresh picked peaches in the summer or frozen peaches in the winter. Preheat the oven to 375 degrees Fahrenheit. Place the butter in a 9x9 or 10x10 inch pan. Melt the butter in the preheated oven (takes just a few minutes). In a medium bowl, mix together flour, white and brown sugar, cinnamon, and nutmeg. Slowly pour in the milk, mixing until combined. It should be like a thick cake batter. Add the sliced peaches to the melted butter. Mix the cobbler batter into the peach and butter mixture. Bake for 45-50 minutes, until the top is nicely browned. Enjoy warm the same day, or keep for up to 3 days refrigerated. To refrigerate, first let the cobbler cool to room temperature (2-3 hours), then store covered.